Grace, a disabled squirrel, was seized from her home and caregivers on 26 August 2014, by Alabama Wildlife and Freshwater Fisheries without an official warrant - just a plain white typed paper – not on official letterhead. This department prefers plan to EUTHANIZE Grace, rather than allow her safe return home. 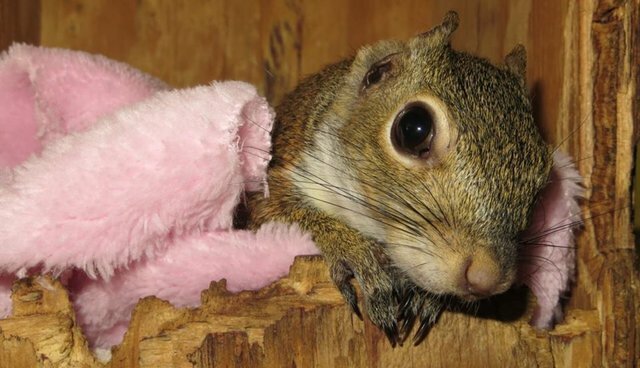 In November 2013, a squirrel fought for her life after sustaining multiple, severe injuries on a daycare playground. Her head was trapped in a toy Tonka truck, and she was left to struggle for 2-3 days in the hot Florida heat by day and in thunderstorms by night. Weak and near death, the squirrel was finally taken by someone to a veterinarian, who had to cut the truck from her now severely mangled, swollen head and neck. The squirrel, later known as Grace, sustained multiple, severe injuries, including very deep cuts and lacerations around her neck, head, ears and shoulders, a collapsed lung and permanent, partial vision and hearing loss. She broke several toes attempting to pull herself free from the toy truck. Her ears were ripped so severely, that as the tissue became necrotic and died, maggots infested her ears, and chunks of her ear flaps later fell off of her body. Reba and Tommy Morse were asked by the veterinarian to take her in and give any care she could to the critically injured squirrel. Reba and Tommy Morse, who had lived in Florida for more than 25 years, had worked with the rehabilitation of wildlife throughout their entire lives. Both strongly believe in animal rehabilitation with the goal of returning releasable animals to the wild. Day and night, Reba cleaned and dressed the squirrel's wounds, tried to administer fluids, and tried to soothe the weak squirrel by rocking with her, softly singing "Amazing Grace"... the origin of her name. It was unclear for quite some time if the squirrel would succumb to her extensive injuries. On their public Facebook page, which features mostly special needs animals and teaches kindness and how to care for those who might need a little extra help, Reba shared the story of this terribly injured squirre. Soon, from the song sung to soothe her, her Facebook followers named the little squirrel Amazing Grace. Reba took Grace for extensive medical care and evaluation at a University of Florida veterinary school, where it was determined Grace suffered permanent disabilities and would be a non-releasable animal. Reba and Tommy took Grace back to their Marion County, Florida home and began the process of socializing her to try to give her the best captive life possible. Through continued, ongoing care, Grace quickly became part of their family. Grace normally receives necessary, customized ongoing care, developed by the university veterinary medical specialists and by Reba. She has been kept from this care by It is important at this point to note, in the state of Florida, it is completely legal for Reba and Tommy Morse to provide a home and care for squirrels. Also, at this time, Reba became target of an ongoing campaign of cyberbullying, jealousy, cyber stalking and vindictiveness, which focuses its efforts on attempts to prevent Reba from any animal rehabilitation efforts and from obtaining special permits despite receiving high scores on all required exams. In the Spring of this year, Reba and Tommy Morse relocated to Bibb County, Alabama, while still maintaining their other home in Marion County, Florida. On August 26 2014, Grace, who is very fragile, and the 2 flying squirrels were seized by the Alabama Wildlife and Freshwater Fisheries department. No official warrant was presented...just a plain white paper – not even on official letterhead. This department refuses to tell Reba and Tommy where they took Grace and the 2 flying squirrels or about Grace's current condition, only that they would be left with and evaluated by a rehabber to determine if they are considered releasable. Alabama Wildlife & Freshwater Fisheries officers informed Reba that if Grace is deemed non-releasable due to her disabilities by their agency, the Alabama Wildlife and Freshwater Fisheries department PREFERS TO EUTHANIZE Grace, rather than allow her to return to her home, to live for years to come and to be cared for with her special needs. Now, Grace, left with disabilities from her injuries, faces another life and death struggle......with the Alabama Wildlife and Freshwater Fisheries Department...battling for her very life that she fought so hard to save. Please watch this video which details Grace's tory, and please also sign this petition to help SAVE GRACE and BRING GRACE HOME Thank you.